We’ve worked on projects big and small, locally and internationally, but we have to admit that working within our community is really close to our heart. Team Domenica is a social enterprise charity set up to help people with learning difficulties find meaningful employment. 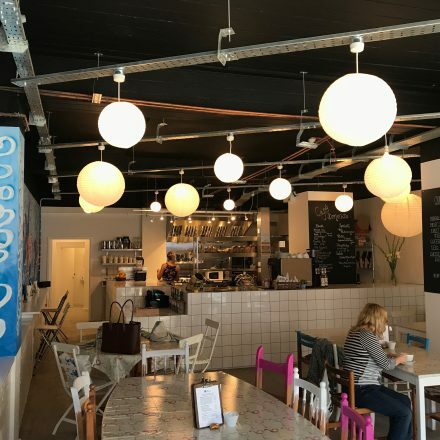 They wanted to create a cafe in Brighton where they could offer employment to those who might otherwise struggle to find a job. Being a charity, budgets were tight, but we were sure we could make a difference in the Old Steine site. Rather than spending money on expensive furniture and fittings our plan was to bring vibrancy to the project with paint. 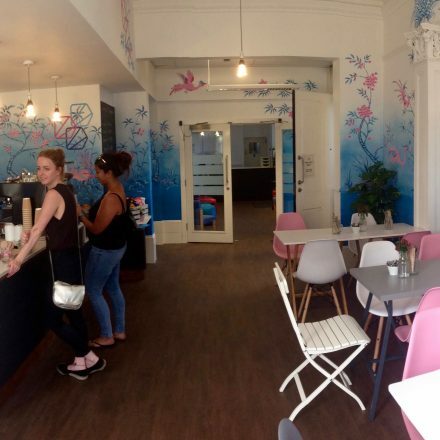 Founder, Rosa Moncton loves Flamingos and so that’s what influenced the interior. Dave Pop (@davepopart on Instagram) painted the walls with incredible murals of the tropical birds and so Team Domenica’s first cafe was brought to life. Sadly the site on the Old Steine was not to be a permanent home and so Team Domenica moved to Preston road where we were again happy to work with them to deliver the cafe that stands today. As the venture grew, they were given the opportunity to take up residency within Hove Library. 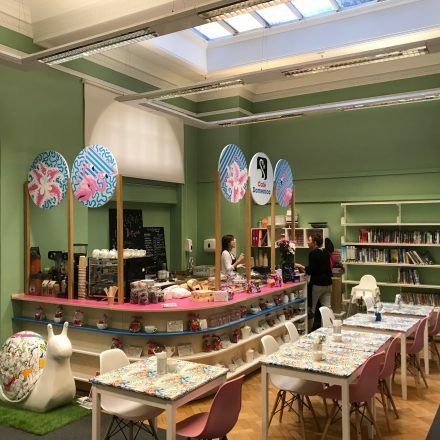 Working within the restraints of a listed building was a challenge as we weren’t able to paint the walls with the same murals we had in the other two cafes, but instead we took influence from the round windows at the front of the library and brought the same magnificent artwork to the cafe with some raised, circular boards. The main counter is wheel mounted so has the potential to move, although I wouldn’t want to try and move it. 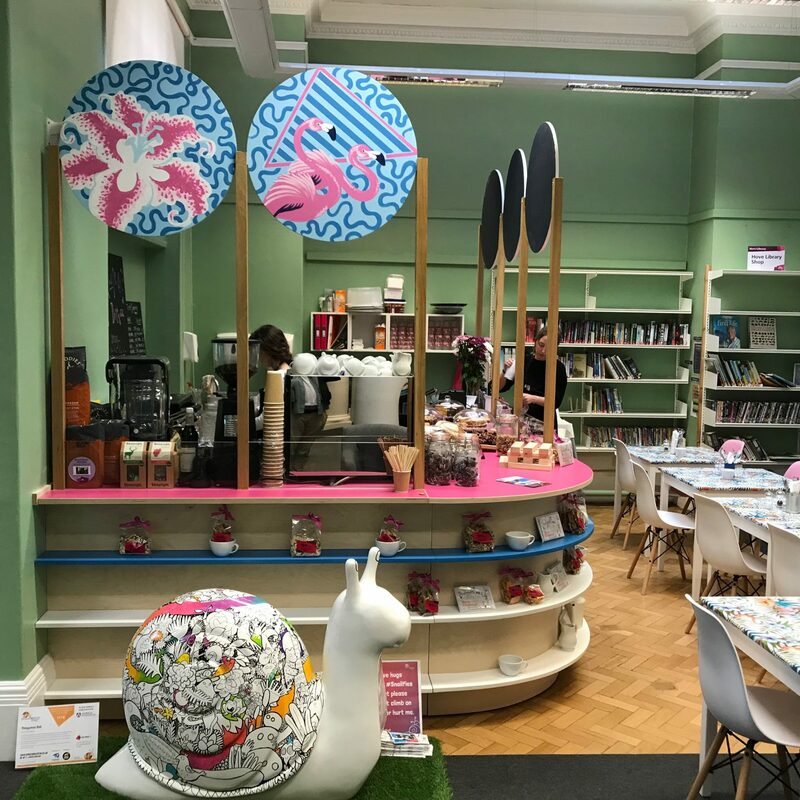 The Hove Library cafe is open Monday – Saturday 10am – 5pm and is staffed by Team Domenica candidates.